The Toxicity of Oil: What's the Big Deal? This is part of an ongoing exploration of society's relationship with oil and the large part oil plays in all of our lives. AUGUST 27, 2012 -- Dealing with a major oil spill is a huge effort, sometimes requiring billions of dollars and involving hundreds, even thousands of people. Yet, oil is a natural material that seeps from the ground or into the ocean in many locations around the world. So why is it so important to respond to an oil spill, anyway? The main reason is that oil is also a toxic material that can cause environmental damage where it spills. The central purpose of oil spill response is to reduce that damage. We call something toxic if it harms living things. The amount of harm caused depends on how an organism is exposed and to how much oil. For example, crude oil is considered toxic and causes two main kinds of injury: physical and biochemical. 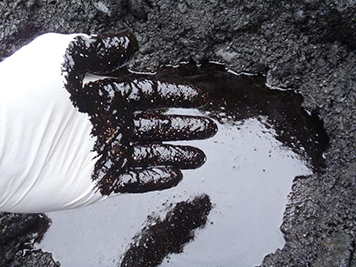 The physical effects of freshly spilled crude oil are all too obvious. You've likely seen the disturbing images of birds and other animals coated in crude oil, struggling to survive. When oil washes ashore, it can completely cover and smother the plants and animals living there. Crude oil not only destroys the insulating properties of animal fur and bird feathers, which can lead to hypothermia, but it also impairs animals' abilities to fly and swim, sometimes causing oiled animals to drown. During the months after the 1989 Exxon Valdez oil spill, researchers collected about 30,000 dead birds—ranging over 90 different species—from the oiled areas, and they estimated that perhaps ten times as many birds died. Spilled oil also can harm life because its chemical constituents are poisonous. As we previously learned, petroleum-derived oil is a complex mixture of thousands of chemical compounds. Given oil's chemical complexity, we need to consider how these different components—and their very different effects on living things—cause harm. Let's look at two important components of crude oil: volatile organic compounds (VOCs) and polycyclic aromatic hydrocarbons (PAHs). In terms of how long they remain in the environment, they represent two ends of a spectrum. All crude oil contains VOCs, which readily evaporate into the air, giving crude oil a distinctive odor. Some VOCs are acutely toxic when inhaled, in addition to being potentially cancer-causing. At the site of a fresh oil spill, these VOCs can threaten nearby residents, responders working on the spill, air-breathing marine mammals, and sea turtles at the water surface. However, VOCs are generally a response concern only right after oil is spilled, because oil floating on the sea surface quickly loses its VOCs. In contrast, PAHs can persist in the environment for many years, in some cases continuing to harm organisms long after the oil first spills. How PAHs in oil do that is an active area of research. 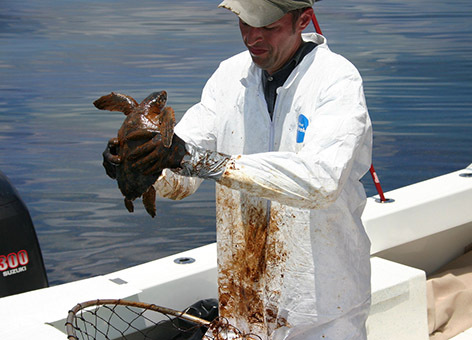 For example, our colleagues at NOAA's Auke Bay Laboratory near Juneau, Alaska, investigated the possible biological effects of oil that spilled from the Exxon Valdez in 1989 but still remains at very low concentrations in weathered oil in beach sediments at locations scattered around Prince William Sound. The Auke Bay Lab researchers conducted a series of studies that continued for more than a decade. They found that even though the levels of PAHs leaching from weathered oil buried in beach sediments were very low, the PAHs still caused negative effects to incubating herring and salmon eggs. The good news from these studies is that over the years, the concentration of PAHs has declined in the Sound's beach sediments, to the point that those particular toxic effects on fish eggs have diminished as well. However, at a few sites in the Sound, sea otters are eating clams that may continue to be contaminated by leaching PAHs in buried oil. The Northwest Fisheries Science Center, another NOAA research laboratory in Seattle, Wash., has studied the chemical physiology of how PAHs harm developing fish. The researchers found that some PAHs in oil inhibit proper heart development in fish embryos, which can either kill the fish outright or make them more susceptible to predation and disease. With so many varying factors coming into play, predicting the impacts of an oil spill can be quite challenging. It’s important to know the specific chemical makeup of an oil (and how that makeup changes over time as the oil weathers). This information will give us clues about how that oil will interact with organisms and the environment and, hopefully, will help us figure out how to keep those impacts low.